LONDON – The memory of how I introduced Martin Short, who is 65 today, to Steve Martin still cracks me up but I’ve discovered that I’m the only one who thinks it’s funny. It was backstage at the “Pee Wee Herman Show”, long before the Tim Burton movie, at the Roxy Theatre in Los Angeles on May 5, 1981. My friend Anne Lockhart, who starred as Sheba in the original “Battlestar Galactica”, had invited me. She had worked with Herman on Steve Martin’s third NBC TV special and when the show was over, she took me back to meet them. I was chatting with Steve Martin and Bernadette Peters when I noticed Martin Short nearby with Steven Kampmann, who would go on to co-star in “Newhart”. They had worked together in Canada on “SCTV” and at “Second City” in Toronto where my friend and longtime colleague Bruce Blackadar, who covered nightlife amongst other things for The Toronto Star, had introduced me to Martin Short. I turned to say hello to Short and gathered that they hoped for an introduction. I beckoned them over and declared, “Steve, Martin – Steve Martin’. Still gives me a chuckle. I haven’t run into either of them to see if they recall that moment but it’s the way I remember it. I forgot to ask Steve Martin when I interviewed him at the Toronto film festival when he was there with “All of Me” in 1984 and I haven’t run into Short in my travels. He was in brilliant form when he was in Toronto and at “Second City” he did the best impression you can imagine of Frank Sinatra among many sketches written and improvised. The films he’s made with Steve Martin have been enjoyable but none better than the hilarious “The Three Amigos” with Chevy Chase (pictured). 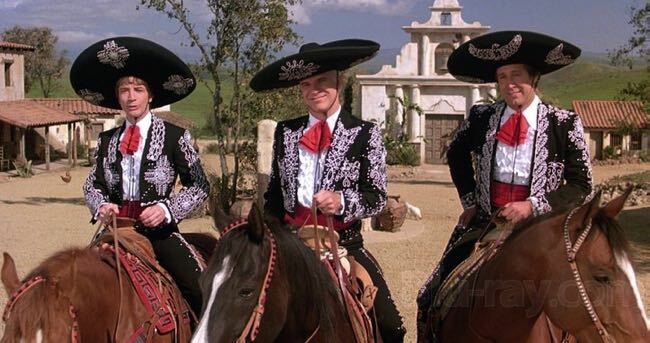 Maybe someday someone will think my tale of three amigos is amusing. This entry was posted in Film, Memory Lane, Recalling ..., Theatre and tagged Anne Lockhart, Bernadette Peters, Martin Short, Pee Wee Herman, Roxy Theatre, Steve Martin, Steven Kampmann. Bookmark the permalink.